Famovape Yup RDA Review - Daily Vaping Deals & The Best Vape Product Reviews at Vaping Cheap! In this review, we’ll be taking a close look at one of the first releases by the new company Famovape, the Yup RDA. This atomizer is available in a wide range of color options, and sports a unique Y-Shaped build deck, which makes coil installs a breeze. Vapers who enjoy top airflow atomizers will take interest in this one as it does feature angled top airflow design allowing for air to travel through and under the coil, and best of all, reduce any chances of leaking! Before getting any further, we’d like to thank Famovape for sending this atomizer our way for the purposes of this review. We’ll cover our first impressions, building and wicking, performance, pros and cons, and conclude with whether or not we recommend the Famovape Yup RDA! Click Here to Check Out the Famovape Yup RDA! 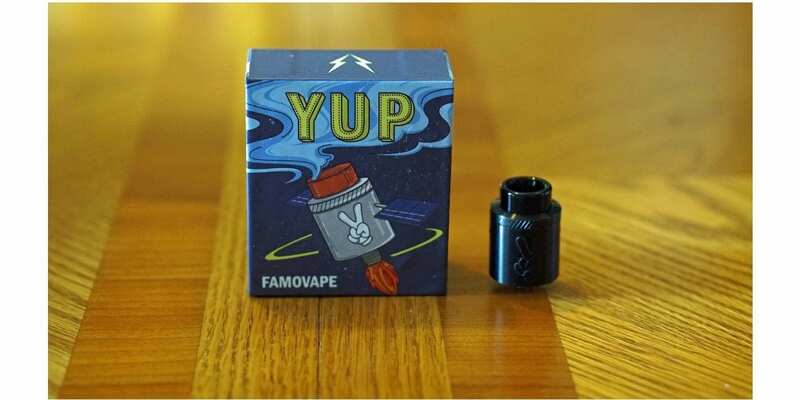 The Yup RDA by Famovape comes in a rather small box that shows the product right at the front. On the back is where you’ll see all of the features, on the right side it’ll let you know what’s inside of the packaging and on the other side it’ll mention the special “Y” design build deck. Overall, the packaging is good and everything is kept securely inside. Once you slide open the packaging, you’ll see the Yup RDA right away alongside the bag of the spare right under. The color shown in this review is black, but there are other color options available such as Stainless Steel, Blue, Gold and Rainbow. I do like the fact there’s quite a few color options, as many vapers enjoy having the option of picking from different colors. Also, depending on which color you choose will determine what color drip tip you receive. 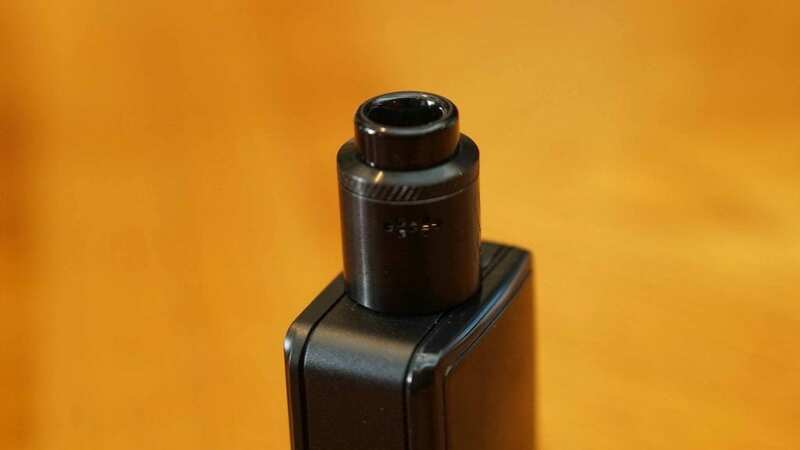 For example, since my RDA is the black color option, I did receive a black drip tip. However, if you choose the blue color, the drip tip included is also blue. The included drip tip is an 810 sized drip tip, which means you can use other custom 810 drip tips you may have, which is always a good thing! In addition, a 510 drip tip adapter is included in the package, giving you even more options. Also included in the package is a gold plated squonk pin, a screwdriver, spare screws and o-rings. My first impression of the actual RDA is that I really did like the overall look, especially with the black color option as with the matching drip tip, it has a “murdered” out look to it. What’s also interesting is the airflow itself, rather than one long slot, there’s 7 airflow holes on each side, and it is fully adjustable. Something else I noticed with this RDA is that it locks into place when the top cap is on. This is great to have as this feature makes it easy to take it off of your mods, and when you’re adjusting the airflow, the deck itself will not spin by accident. Overall, my first impressions of the Famovape Yup RDA was good! It came clean with little to no machine oil, and I was definitely excited to install some coils! Liked mentioned previously, the Famovape Yup RDA features a unique “Y” shaped build deck. It’s basically has raised posts, but the posts themselves are angled. It’s very similar yet different when compared to the Dead Rabbit or Drop RDA. These style build decks are pretty easy to use, and makes for coil installs quick with little to no frustration, especially if you’re a experienced vaper. I do want to mention that the posts are gold plated, which is a good thing in my opinion. Now, when it comes to building on this atomizer, you don’t really have to measure exactly where to cut your leads since you have space under the posts to cut any excess wire. However, I tend to pre-cut and measure my coil leads regardless, but that’s just a preference of mine as this is not something you have to do. It is recommended though that you trim your leads just a bit so it’s not very long and easy to cut from underneath the posts. You can also fit some pretty beefy coils in here, and I had no issues installing a pair of 3mm inner diameter quad core Fused Claptons. Something I recommend is that when you’re installing your coils, make sure to lift them just a little so that the airflow will hit the coils directly, and have some airflow travel underneath. For me, this will provide the best flavor from this atomizer. However, be sure to always mess with the coil positioning as you may enjoy this RDA with a different coil height. This is pretty much with any RDA. I do want to mention though that when you are tightening down your coils, do not over tighten them as I’ve had the screws clip my wire before. When this happens, I literally have to install a new pair or another coil. I wouldn’t necessarily say this is a con, but it’s definitely something to mention and watch out for when building on this RDA. Other than that this atomizer is easy to build on, simply pre-cut your wires a bit, drop them into place, tighten them, cut any excess wire from underneath and you’re good to go! Wicking the Famovape Yup RDA is also straightforward, but you do want to keep your cotton on the longer side. When wicking this atomizer, you want to make sure that the cotton is able to touch the juice well. There are slots in the deck itself for you to place your cotton, which is great, but just be sure to trim your wick so it’s able to touch the bottom of it and feed e-juice to your coils when you’re either dripping or squonking. This is especially important when squonking. All in all, building and wicking the Yup RDA is pretty easy overall and it was expected due to its deck design. I did have an issue with the screws clipping my leads, but it wasn’t a deal breaker for me, more of an annoyance when it occurred. Now the biggest question, as with many atomizer reviews, is how is the performance? Well, I can certainly say that the performance of the Yup RDA did not disappoint whatsoever! Like mentioned previously, be sure to adjust the coil positioning to find your sweet spot. For me, I enjoyed this RDA and got the best flavor when the airflow traveled underneath and through the center of the coil rather than hitting towards the top of the coil. With these type of RDAs with top angled airflow, coil positioning can play a huge part in the performance. With that being said, the airflow is nice and smooth. With it wide open, there is a very slight restriction to the draw, so it you like super wide open airflow where you can pretty much breath out of, then you might not enjoy this atomizer. However, if you do enjoy airflow with a slight restrictiveness to it, you’ll definitely enjoy the airflow the Yup RDA has to offer. Personally, I liked to close off the airflow just a little where 1 to 3 airflow holes are closed as I do prefer a more restrictive direct lung vape. With the airflow like this, the flavor was just a bit better, and it was a slightly warmer vape as well. My preferred coil build was a dual Fused Clapton with all NiChrome 80 wire. This build had a resistance of about 0.2 ohm and I would vape it between 65w and 80w. At this wattage and coil build, I would get a warm and flavorful vape experience. There is also a single coil airflow option as well if you wanted to run this RDA in single coil mode. I didn’t really care for a single coil build in the Yup RDA to be honest, but it’s always a good thing to have that option! With the 7 small airflow holes on each side, it does make for a very smooth and relatively quiet draw. I also expected this due to my past experiences with RDAs with similar airflow designs. Another great feature is the locking top cap, which ensures that your airflow is always in the right position. In addition, it makes it incredibly easy to take this atomizer off of any of your vape mods. The top cap also features knurling at the top which makes it easy to grip and adjust your airflow. When it comes to squonking or regular dripping, this atomizer is great for either. 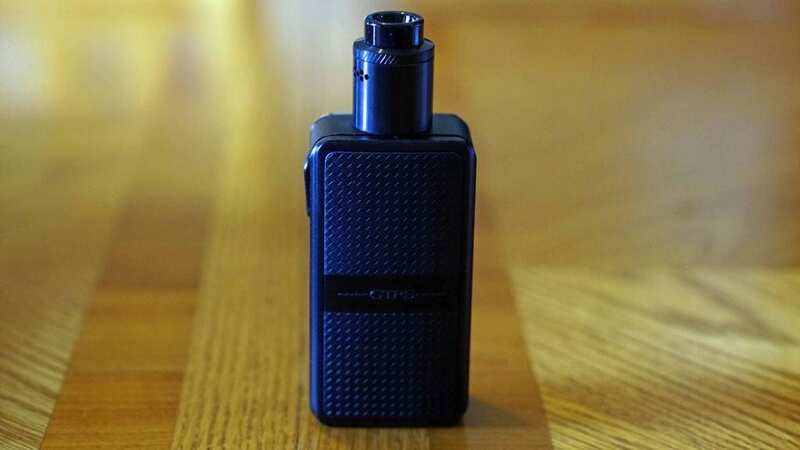 When dripping, you can easily drip e-liquid right down through the wide bore 810 drip tip, and when squonking you can fill this out with plenty of e-juice before you have to worry if it’s going to leak. 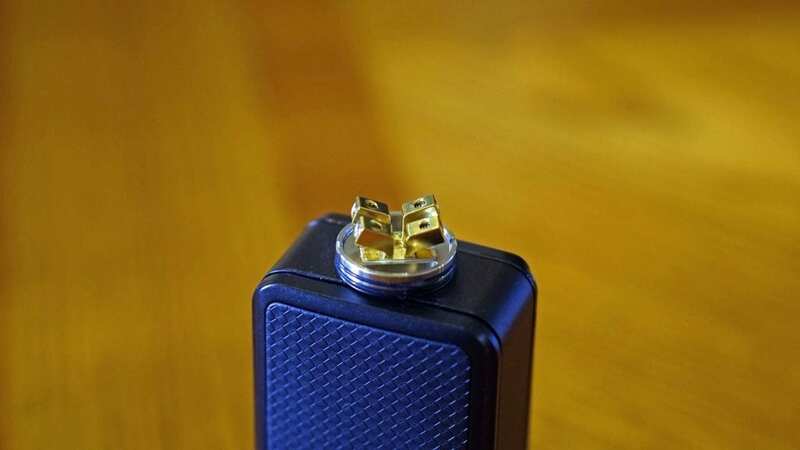 Now, do keep in mind that if you do squonk or drip a lot of e-liquid, don’t tip this RDA to it’s side or take off the top cap as it’ll probably result with leaking and e-liquid getting all over your device. Overall, the performance of the Famovape Yup RDA was great! The airflow is silky smooth, and the flavor was very good! Not to mention, the locking top cap and knurling is a huge pro in my book! It just adds to the ease of use. In conclusion, the Famovape Yup RDA is a solid performing atomizer that you can drip or squonk with. Now, I will say that it does share some similarities to other RDAs on the market, but adds some differences and improvements such as the locking top cap which ensures the airflow is always in the right position. The 7 small airflow holes on each side does create a smooth and rather quiet draw as well, which is something that many desire in an RDA. As with any atomizer, there were some cons to be mentioned. The first was the fact that the screws did clip my leads, so just make sure you’re careful and not over tightening your coils like I did the first time around. The other is that this RDA can leak if you over drip or squonk too much e-liquid, and this is the case with pretty much any atomizer. Although it’s top airflow, just be mindful of how much e-juice is present as it can always leak if you accidentally tip the RDA to the side. Lastly, no 510 drip tip is included, this is something I would’ve like to see included as they do give you an adapter. All in all, I think the Yup RDA is a pretty good performing atomizer that offers some great features at a low price. If you enjoy top angled airflow RDAs or simply looking for a new rebuildable dripping atomizer that’s easy to use, then I do recommend checking it out! We hope you find this review helpful in finding the right RDA to fit all of your vaping needs! Feel free to leave any questions or comments down below! Thanks for reading our Famovape Yup RDA Review!